Event Description: Situated halfway between Santa Barbara and Los Angeles, charming coastal Ventura is a relatively undiscovered gem on the Southern Californian coast and wonderful place to do a corporate teambuilding event in the fresh air. 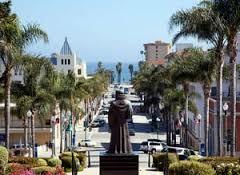 Location History: Father Junipero Serra founded his ninth California mission here in 1782; Erle Stanley Gardner liked it so much he set up his law practice in Ventura while writing his Perry Mason novels. During your corporate teambuilding treasure hunt… expect to encounter fountains and historical plaques by the beach promenade and along red-tiled Figueroa Plaza, the majestic Beaux Arts City Hall high on a hill and the “haunted” hallways of the Bella Maggiore Inn.